Which worm is it: bertha, diamondback or cabbage? Economic spray thresholds are calculated based on individual species. We don’t have scientific evidence to combine thresholds, but where an “additive” effect of multiple species can make sense is when more than one species are feeding on key yield-producing areas — flowers, buds and pods — at the same time. For example, if you have lygus bug and cabbage seedpod weevil in the same field and if they are both at 50% to 60% of their economic spray thresholds, spraying may provide an economic benefit. The ideal time to swath for yield and quality is when 50-60% of seeds on the main stem are turning color. At this stage, most seeds on the side branches will have reached maturity and will ripen in the swath. This may not be a safe assumption when very low plant counts result in heavily branched canola plants. Growers considering a pre-harvest glyphosate cannot apply it to canola (RR or non-RR) until seed moisture drops to 30% or lower. This roughly coincides with 30% seed colour change. Spraying earlier raises the potential for glyphosate residue in seed. Lygus bug numbers are high in some fields, but remember that as pods harden and get leathery, lygus will not be able to penetrate and cause damage. 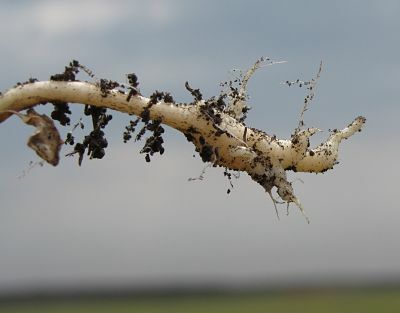 Growers are encouraged to examine strange disease patterns to see if clubroot has arrived on their farms. Malathion CANNOT be used to treat bins where canola will be stored or to treat canola as it goes in to storage.